While digging through the inner workings of Grails in order to improve my OSGi plugin, it is sometimes necessary to inspect the GrailsApplication object and its companion Spring ApplicationContext(s). 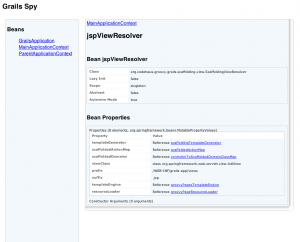 In order to browse the dynamic bean definitions I created a little plugin called Grails Spy, which can be used to watch into an application’s guts. As always, simply execute grails install-plugin spy. Simply browse to http://localhost:8080/myapp/spy/ and have a closer look. Note: this path is NOT PROTECTED, so don’t do this in a production environment! Or at least use one of the security plugins to protect this page. Fernando Takai wrote an excellent bash completion script (also available here, originally from Ted Naleid), which makes calling Grails commands much easier. * works with plugin provided scripts in Grails version >= 1.1, were plugins are stored under $HOME/.grails/grailsversion/projects/appname/plugins. * detects the Grails version from $GRAILS_HOME instead of choosing the latest version from $HOME/.grails. My version of the script was tested with Grails 1.2 and OSX Snow Leopard and can be found at GitHub or below. I just wrote a little script to inspect jar and war files, Grails applications and plugins. I tested the script on OSX Snow Leopard, but it should run on other versions of OSX and Linux, too. The Grails OSGi plugin provides scripts to package a Grails application as an OSGi bundle. Additionally the bundle(s) may be run in an OSGi container assembled ad hoc by the excellent Pax Runner or deployed to a SpringSource DM Server. The application can be accessed at http://localhost:8080/myapp/. The OSGi runtime is based on the Equinox OSGi framework, Pax Web and some additional bundles. The Felix Web Management Console provides excellent insight into the inner workings (see Screenshots). It can be accessed at http://localhost:8080/system/console/ with user “admin” and password “admin”. The command grails run-bundle drops the user in the Equinox Shell. Typing help shows the available commands. In order to be a valid OSGi bundle, the application is war’ed and provided with the necessary bundle manifest headers (see scripts/_Event.groovy for details). 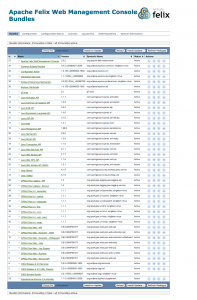 The OSGi runtime is assembled in the target/osgi directory. The first step on the road to running Grails applications in an OSGi environment is to get a simple application to run as a monolithic bundle (almost) without changes. We create a simple Grails application (e.g. 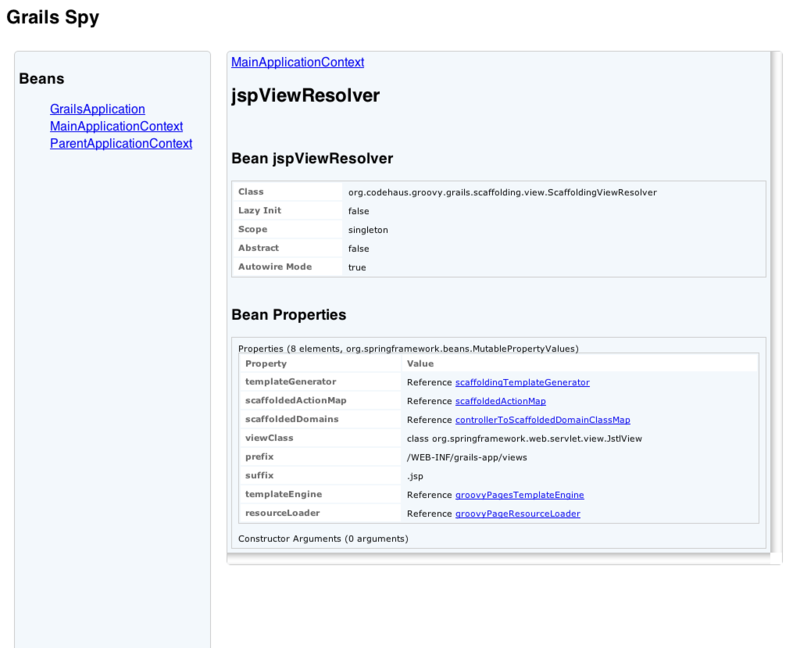 the one described in a article on developer works; the application has a single domain class Trip, the controller and all views are generated). A single domain class and the corresponding controller is all we need for a simple test. A bundle is basically a JAR or WAR with some special headers in its manifest file. Required headers are Bundle-SymbolicName, which uniquely identifies the bundle, Bundle-Version, which specifies the bundle version (multiple versions of the bundle can run concurrently!) and Bundle-ClassPath, which specifies the classpath within the bundle. Other important headers are Import-Package and Export-Package, which are necessary when using code and resources from and providing classes to other bundles. In the future, the changes could either be integrated into Grails directly or into a OSGi plugin. Our Grails application will need to be transformed into a bundle, so we package it using grails war. The application and all dependencies are contained in the resulting WAR file. Note that Bundle-ClassPath contains all dependencies required by Grails, JAR files from the lib/ directory, and those contributed by installed Grails plugins. The bundle imports some packages from the Servlet specification. This is to ensure, that the bundle uses the same classes as the web container, otherwise the classes would not be compatible, as they would be loaded by different class loaders. 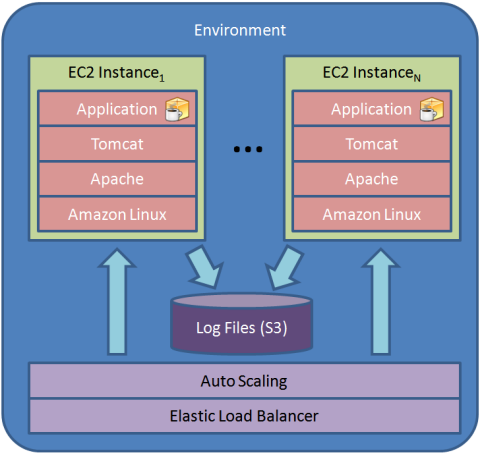 In order to run the bundle, it must be installed into an OSGi container like Equinox (the base for the Eclipse IDE), Apache Felix, or Knopflerfish. The test environment described below uses Equinox. Other frameworks could be used as well, but I haven't tested them yet. The remaining part is a module usually called Web Extender, which bridges the gap between web applications and the web container. The web extender looks for bundles matching a certain criteria (e.g. existance of WEB-INF/web.xml or some bundle headers) and configures these as a web application. Candidates are Pax Web and Spring-DM. As Pax Web is currently not able to configure a Grails applications because of PAXWEB-148, and Spring-DM will probably be required for other OSGi and Spring related stuff anyway, we use the latter as Web Extender. The test environment is made up of the excellent Pax Runner with a set of configuration files. Pax Runner is basically a starter for OSGi applications. It supports different OSGi frameworks and provisions both framework and bundles from sources like Maven repos, web servers, or directories. The test environment loads the Equinox OSGi Framework (version 3.5.1), Spring-DM 2.0M1, Spring 3.0RC1, and Jetty (Tomcat doesn’t work right know). All configuration files be found on GitHub. After lots of log messages, we arrive at a prompt of the command shell. Help is available using help. The application should now be reachable at http://localhost:8080/trip-planner-0.1/. If you get a 404 HTTP error, wait a moment, to give the web extender time to configure the bundle. The system directory serves as the current directory of the OSGi container. The HSQLdb files from our test application will be created there, log messages of the container are written to the system/logs directory. If our web bundle has been changed, we can simply update it using update 60. If this does not work, we can un- and reinstall it using uninstall 60 and the installation procedure described above. As outlined in part 1, the ultimate goal is to create modular Grails applications. The next step will be to extract the dependencies from the monolithic bundle and put them into their own bundles. Spring and Groovy are already available as bundles, other dependencies may need to be replaced with an OSGi-ready version, e.g. from the SpringSource Bundle Repository. There will be some issues regarding singletons (e.g. ApplicationHolder, ConfigurationHolder) and class loading (Hibernate), but I think, they can be resolved with some work. The findings may finally find their way into Grails or a Grails OSGi plugin. The OSGi Alliance (formerly known as the Open Services Gateway initiative) is a consortium of companies in the Java world, which develop the OSGi Service Platform, a framework for component-oriented software. Originally developed for embeded devices, OSGi frameworks can now also be found in enterprise, mobile, home, telematics and consumer products. Applications in an OSGi environment are split into individual modules called bundles, which are usually provided as jar files. Each bundle provides a manifest file containing meta data, which describe its name, version, dependencies and offerings, i.e. code and services. An OSGi container can host multiple applications at once, each application can be started or stopped any time. The OSGi specifications describe both the core framework and a set of standard services for common functionality such as logging, web access, declarative services, etc. A more detailed description can be found here. There are multiple OSGi implementations available. Well-known open source implementations include Equinox, which is the base for the Eclipse IDE and eco system, Apache Felix and Knopflerfish. Update: Grails 1.2 will contain a valid OSGi bundle manifest, so the Grails jars may already be pulled out of a Grails application bundle and installed sepearately. This can be seen as a first step of an OSGi-fied Grails application and should be already possible today with some manual steps. The Grails application is packaged as a WAR file with the manifest file containing necessary OSGi headers, like Bundle-SymbolicName, Bundle-Version, Bundle-ClassPath, and Import-Package. An OSGi framework providing a web service and corresponding web extender like Spring-DM or Pax Web can now run this application. The next step will be splitting a Grails application into individual bundles. Ideally each of Grails’ and the application’s dependencies like Hibernate, Sitemesh, etc. would come as its own (set of) bundle(s). Spring and Groovy already contain OSGi meta data and can be run unmodified in an OSGi environment, OSGi-fied bundles of some other dependencies can be found in the bundle repositories provided by SpringSource, Apache Felix, or Knopflerfish. Eclipse also hosts some third-party libraries, e.g. 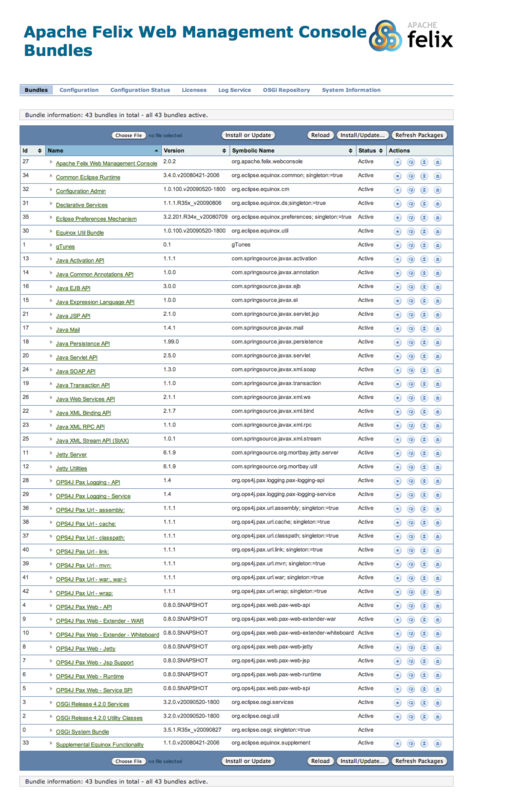 many commonly-used Apache jars, which were converted to OSGi bundles, in the Orbit project. The Grails application itself would be another bundle. As it contains no dependencies, it would be quite small and can therefore easily be transferred to an application server. (*) This is also the case when running more than one Grails application in a servlet container with shared jars, e.g. using grails war --nojars. Many posts on the Grails mailing list ask for ways to modularize big web applications. 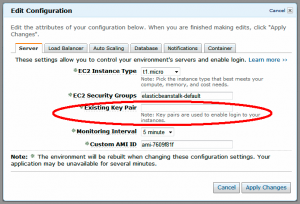 The most common answer and approach is to split the application into multiple Grails plugins. In an OSGi environment, the Grails application could be split into multiple bundles, each of which can be individually updated or reloaded. Each Grails plugin would compose a bundle of its own, which could be used and shared by multiple Grails applications. A starting point for implementing this approach could be the newly created Spring Slices project. The Grails development mode (aka grails run-app) could also profit from OSGi support. With the OSGi framework constantly running, changes could be integrated by simply updating or reloading individual bundles. Even major changes would only mean reloading some bundles. 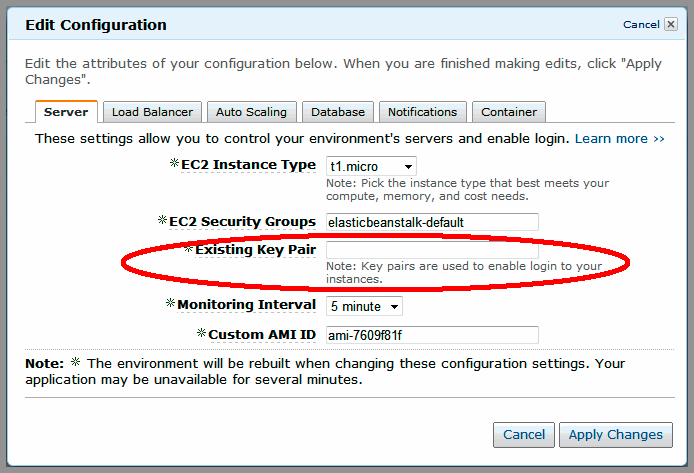 This would reduce startup times, as the VM is always running and does not need to be stopped and restarted. For extreme cases, each controller/domain class/Grails artefact could even be temporarily packaged in its own bundle. PlugRepo was mentioned in the most recent edition of Grails Podcast. Thanks, Glen and Sven! 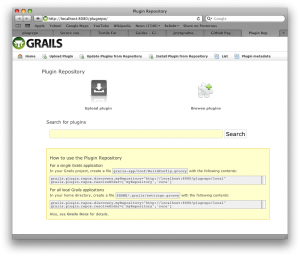 Plugrepo is an offline Grails (and maybe Griffon) plugin repository. It can be used as an offline proxy for the grails.org repository as well as a repository for internal plugins, which are not ment to be published.